AAPG Datapages and the GIS Publications Committee wish to thank Dr. Ricardo J. Padilla y Sánchez for allowing the GIS project of the Tectonic Map of Mexico 2013 to be posted on Datapages' GIS Open Files page, thereby making it available to the public as a free download. 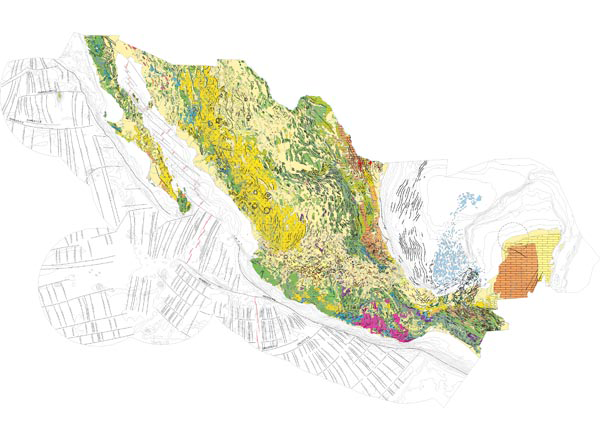 This compilation shows key geologic information about Mexico. Specific data includes a geologic map, surface and subsurface faults, folds, fractures, oil and gas fields, topography and bathymetry, oceanic tectonic features, and ocean crust ages. Also included are volcanoes, calderas, major rivers, meteorite craters, and state capitals and boundaries. Padilla y Sánchez, R.J., Domínguez Trejo, I., López Azcárraga, A.G., Mota Nieto, J., Fuentes Menes, A.O., Rosique Naranjo, F., Germán Castelán, E.A., Campos Arriola, S.E., 2013, National Autonomous University of Mexico Tectonic Map of Mexico GIS Project, American Association of Petroleum Geologists GIS Open Files series.